After a solar storm practically shuts down every city on the planet, there is pure and utter chaos. Jacob and his family live in an Amish community near Lancaster, Pennsylvania. Their lifestyle leaves them virtually the only people unaffected. Already self sufficient farmers and skilled workmen who use little or no electricity, these families continue on their peaceful, quiet daily routine. When news of the world outside their settlement starts to trickle in and violence and desperation inch closer, their ethics, practices and conscience must lead the way. Narrated by Jacob, a farmer living with his wife Hannah and their two children - they must choose how they can serve G-d and question what it will take to survive. This very simple story quietly examines technology, morality and the goodness that can be ripped from mankind when desperation occurs. What begins as “what would you do to save your family?” quickly transforms into “what kind of life are we living every single day?” After my own summer melt down where I was reading books that although wonderful, were becoming indecipherable - When the English Fall completely woke up each of my senses. Similar to A Prayer for the Dying by Stewart O’Nan, this beautifully written novel by David Williams will leave you both fascinated and a little nervous. I don’t think it was meant to scare you as much as to force you to contemplate the choices we make every day. Highly recommend this fabulous new book! Absolute 5 STARS! 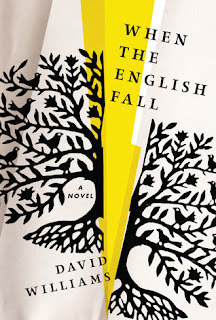 I've been very curious about When the english Fall, so am thrilled to read your wonderful review. Sounds like a special book.